The families of the Donner Party faced horrible choices and made tough decisions the best they could. Even today, people become trapped by storms and face the same horrible choices as the Donner Party: whether to wait for rescue or go for help. Reuters reported on December 31, 2018 that a New Mexico family of four was rescued after four days in snowy mountains. A man and his three children, ages 11 to 14, were elk hunting in the Lincoln National Forest when a blizzard hit the area. The family got stuck in their pickup truck in the snow and stayed hunkered down in their truck until found by rescuers. The Des Moines Register reported on November 29, 2018 that a 72 year old woman took a wrong turn onto an Iowa dirt road that was not traveled at that time of the year and her car became stuck in the mud. She tried to walk to a nearby farmhouse but kept getting stuck in the mud, so she returned to her car. She was rescued after three days when an 11-inch blizzard led two teenagers to ride their snowmobiles and they found her in the car. CBS News reported on March 27, 2018 that a Marysville, California woman was extremely traumatized after being stranded for 10 days in the snow. (Marysville is in the Sacramento valley and was named for Donner Party survivor Mary Murphy.) The 54-year old woman took a wrong turn driving to work and ran out of gas on a a snow covered road near Camptonville in the foothills of the Sierra Nevada mountains, 45 miles from her home. She had no cellphone service and survived on a single bottle of water and by eating snow. Rescuers had searched near her intended route. After 10 days she left her SUV and walked a mile to a road where a Good Samaritan stopped to help her. Sacramento CBS channel 13 reported on February 5, 2018 that seven people got stuck while off-roading on the Rubicon Trail west of Lake Tahoe, California. Two of the party went for help. The next morning the Tahoe Nordic Search and Rescue Team found the other five who had remained with the vehicles. On Tuesday January 24, 2017 at 9:05 pm ET, I was a guest on Travis n Vic Horrors Community Call. This live call and podcast is mostly about cinema horror (and usually in a comedic tone) but once a month they delve into a serious discussion of what they call "real life horror". This monthly discussion often includes authors, historians and other experts who provide the historical facts behind famous "horror" events, such as the Saint Valentines Day Massacre. I discussed the events that led to the Donner Party being trapped in the mountains, and how their story was told over the years. Travis was very well informed about the Donner Party and asked many insightful questions about how they came to be trapped in the mountains. Thanks to the efforts of the Historic Donner Trail Committee a portion of the California Trail from Donner Lake to the Summit wont be abandoned as a public road. This section of the Trail saw less use after the discovery of Roller Pass in 1846, but it became the main route with the construction of the Dutch Flat and Donner Lake Wagon Road in 1852, and later the Lincoln Highway. It decayed after the construction of US Highway 40 and became a Jeep trail until a landowner blocked it. A group of citizens has been fighting to preserve the old trail, and stopped an attempt by Nevada County to abandon the road. On December 22, 2010, the Truckee Donner Land Trust bought 260 acres surrounding a mile long section of the old road, protecting it for future generations. The preservation of the Emigrant Trail is an ongoing battle. The County of Washoe, Nevada considered a request by A&K Earthmovers to build a new gravel pit in the southeast Truckee Meadows area. The proposed plans include leveling a 200-foot knoll covering 68 acres that overlook the Emigrant Trail. According to retired high school teacher and trail historian Fred Horlacher, the gravel pit wont disturb the Trail, but it will be an eyesore. Read the complete story in the Reno Gazette-Journal of October 11, 1999. Trails West Inc., is a non-profit corporation formed by volunteers dedicated to preserving trail markers on the California Trail through Nevada. Starting June 23, 2000 Trails West volunteers revised some signs, and relocated others, to reflect new research about the trail from the Humboldt Sink to Truckee. This created a controversy, as reported by Frank Mullen, Jr. in the Reno Gazette-Journal of June 10, 2000. You can also judge for yourself by examining maps and reading diaries describing the Truckee Meadows. 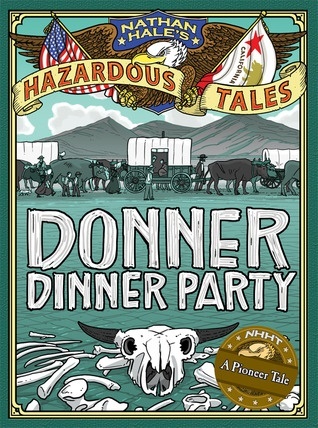 For children and anyone else who enjoy a bit of humor with their history lesson, you can read Donner Dinner Party , Book 5 of Nathan Hales Hazardous Tales , from Amulet Books, New York. The Hazardous Tales are told as graphic novels narrated by Nathan Hale the Revolutionary War hero, the alter-ego of Nathan Hale the author. Mr. Hale does an admirable job of telling a lot of facts about the Donner Party combined with jokes and irreverent observations. The story is told with humorous but accurate drawings of the events, and also maps and charts. Readers will understand the events that led to the Donner Party being trapped in the mountains, and the horrible choices they had to make. Mr. Hales bibliography includes the best of authoritative sources (McGlashan, Stewart) and modern research (Johnson, Mullen), so it is not surprising that the book gets the facts right. Of all the Donner Party books written for children ( Patty Reeds Doll , The Perilous Journey of the Donner Party) , many young readers might prefer the thrilling, shocking and gruesome Donner Dinner Party . You can read what Mr. Hale is writing and thinking on his Hazardous Tales blog. You can order his book from Amazon and other booksellers. For those who want a better idea of Donner Pass, Arcadia Publishing announced the newest addition to their Images of America and Postcards of America series. 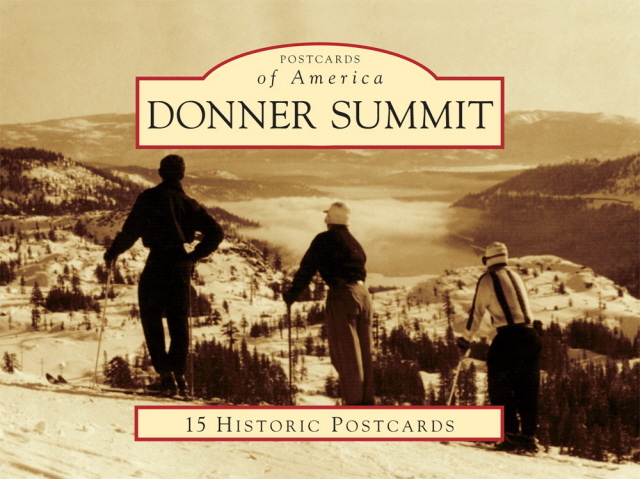 Donner Summit from local author Arthur Sommers includes more than 200 vintage photographs, with a postcard set of 15 historic images. The book includes images of trains, automobiles and skiing in the Donner Pass region. Arthur Sommers has previously authored Auburn , a visual history of Placer Countys seat, and Placer County , both for Arcadias Images of America series. In this volume, Sommers used many images from his personal photograph collection to bring Donner Summits past to life. Additionally, he used images from the Donner Summit Historical Society, Nevada County Historical Society, Placer County Museums Division, and the California State Library in Sacramento. Available at area bookstores, independent retailers, and online retailers, or through Arcadia Publishing at (888)-313-2665 or www.arcadiapublishing.com. There is a new contender for the single book to read to learn about the Donner Party. Historian, novelist and poet Allan W. Eckert, seven-time nominee for the Pulitzer Prize for Literature, has written Dark Journey: The Tragedy of the Donner Party . Mr. Eckert, author of the historical narrative series The Winning of America, says that Dark Journey is fact, not fiction. ... certain techniques normally associated with the novel form have been utilized to help provide continuity and narrative flow. Thus, Mr. Eckert follows in the tradition of George Stewart, who said his book Ordeal by Hunger is strictly factual, based upon the evidence of the sources and upon reasonable deduction from that evidence; it is not fiction. 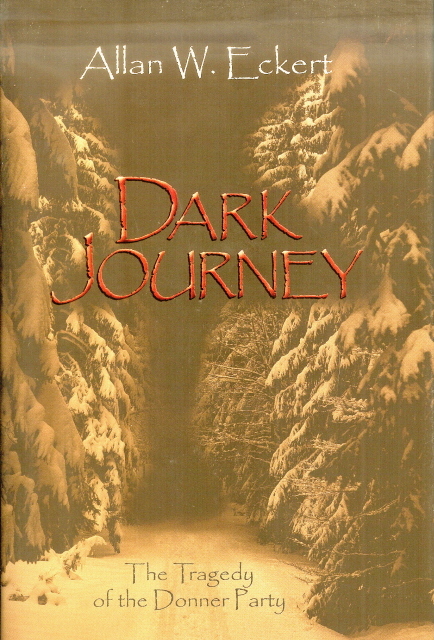 Dark Journey also includes quotes from primary sources, which follows the tradition of C.F. McGlashans History of the Donner Party . Even with the extensive footnotes and quotations from source materials, a few errors crept into Dark Journey. For example, Eckert refers to Margaret Reed as Peggy throughout the book, but it was Margaret Breen, not Margaret Reed, who was known as Peggy. So when Eckert attributes to Margaret Peggy Reed the greeting to the First Relief: Are your men from California or are you angels come from heaven? were not sure who said it. Daniel Rhoads, who told the story to Prof. Bancroft in 1873, simply called her the first woman who had emerged from a hole in the snow. Margaret Reeds daughter Virginia wrote in 1891 that Mr. Breen, not a woman, was the first one up the icy steps, so it could have been Mrs. Breen who spoke the words. Either way, its a great story, and thats what Dark Journey is. Available from the publisher Jesse Stuart Foundation. Celia Hayes has published To Truckees Trail, a novel based on the 1844 journey of the Stephens-Townsend-Murphy Party, who were the first party to successfully bring wagons to California over the Sierra Nevada mountains. The Party, guided by the Mountain Man Caleb Greenwood, met a Paiute Indian named Truckee who showed them a route over a desert to a river that flowed from a lake below a pass in the mountains. The Stephens Party were able to bring their wagons over Truckees Pass, although they were unable to bring them down the mountains until the next Spring. Ms. Hayes tells their story with imagined diary entries from the participants in addition to the narrative. The book is available from the publisher BookLocker. The Donner Party followed Truckees Route two years later, and their fame led to the renaming of Truckees Pass and Truckees Lake to Donner Pass and Donner Lake. Only the river remains named for Truckee. 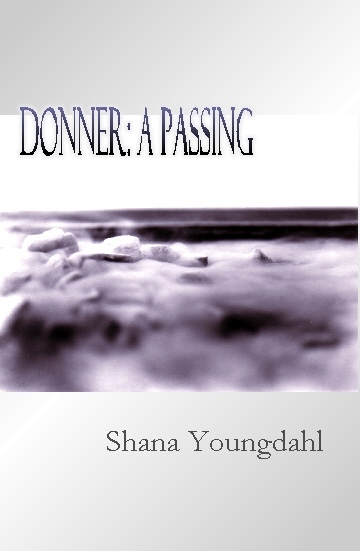 Poet Shana Youngdahl has written a long poem entitled Donner: A Passing. This is not a history in poem form, but the authors attempt to convey the emotional difficulty of the journey and tragedy. Each of the 25 poems describes a particular event, from leaving Springfield to the rescue of Keseburg. The poems are short and terse, similar to haiku, but they cause the reader to pause and consider the event. Ms. Youngdahl is originally from Paradise, CA and draws on the history and landscape of the west in her poetry. Her poetry has been anthologized is the book White Ink: Poems on Mothers and Motherhood (Demeter Press, 2007), and appeared in many national literary magazines including Shenandoah, Margie and Paper Street. She has received writing residencies from Norcroft and Devils Tower national monument. She holds a BA in English from Mills College and an MFA in Poetry from the University of Minnesota. The book is available from Finishing Line Press as a chapbook (a short book of 26 pages). Author and photographer Mark McLaughlin received the Northern California Publishers and Authors award for Best Nonfiction Book of 2006, for his new book The Donner Party: Weathering the Storm. 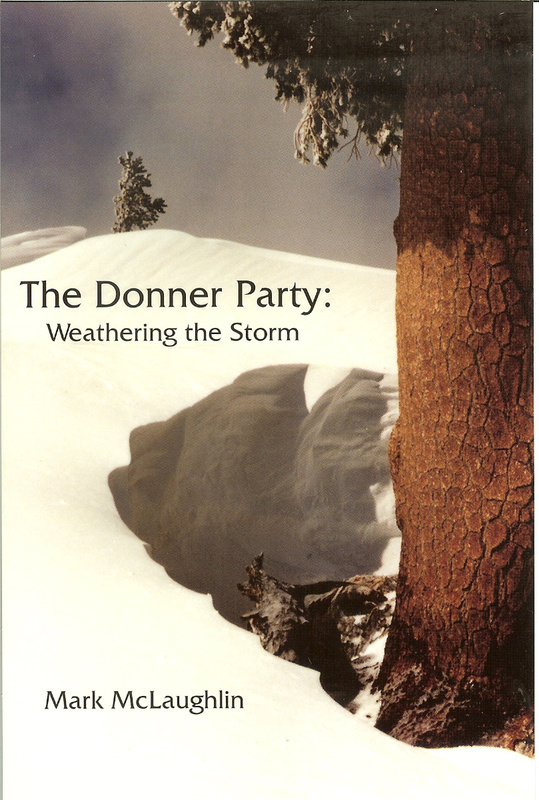 a history of the Donner Party enhanced with research into the weather conditions. The Donner history is well written and includes numerous quotations from primary sources, especially concerning the weather. Among other topics, Mark addresses the evidence that the winter of 1846-47 was unusually wet, and the evidence that the snow depth at Donner Lake was 22 feet. He supplements the history with recent archaeology including the excavations at Alder Creek. The book is available from Marks website. The website also includes climate data, snowfall and snowpack measurements from 1879, a collection of weather stories and other interesting information. Youd have to be pretty brave to write a Donner Party Cookbook , and Terry Del Bene, Ph.D. is. His book combines a history of the Donner Party with recipes for meals similar to those prepared by wagon train emigrants. Mr. Del Bene is an anthropologist who has participated in archaeological digs and living history demonstrations of life on the Oregon-California Trail. So he knows what it takes to survive for five months on the Trail. He also knows what it takes to sell books, so in the proud tradition of previous Donner Party books he plays on the lurid aspects of the story. He includes sample invitations to a Donner Party ... Lose Weight and Party All at the Same Time! But other than the gory cover art and a few shocking statements such as None of the members had any recipes for human flesh before starting their journey, the book is a solid history of the Donner Party and a solid cookbook of trail food. Recipes range from home style favorites such as corn bread and mince meat to camp-out specials such as antelope pudding and elk roast. The recipes use modern ingredients and methods, although Mr. Del Bene details how food was prepared in the 19th Century. Mr. Del Bene puts his own spin on history, such as calling Stantons return and Reed and McCutcheons attempted return Relief Expeditions when that title is usually associated with the parties that reached the survivors in the Spring, which Del Bene calls Rescue Parties. But other than a few minor points, this is a well-researched history with endnotes to explain the more subtle points, even though Del Bene says in the preface that he tried to refrain from the cumbersome system of footnoting. Available from the publisher Horse Creek Publications and from bookstores near you, including Amazon.com. Marian Calabra has written The Perilous Journey of the Donner Party , a highly regarded book for readers aged 9 to 12. Ms. Calabra tells the story from Virginia Reeds point of view, supplemented by other sources and historical details. The book has been critically praised for its sensitive handling of the issue of cannibalism, allowing young readers to understand the hard choices faced by the DonnerParty. Includes a complete transcript of Virginia Reeds 1847 letter. My then 9 year old daughter read the book to prepare for her trip to Sutters Fort, where she portrayed Virginia Reed. My daughter enjoyed the book almost as much as I did. Published by Clarion Books. Available at Amazon.com. 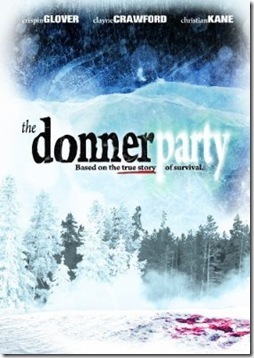 Anacapa Entertainment brought its movie The Donner Party based on the true story of survival, direct to DVD on January 26, 2010. You can order a copy from Amazon.com. The movie was a featured film at the Austin Film Festival. You can watch a clip at MovieWeb.com. The movie was originally titled The Forlorn which was much more evocative of the story and more accurate (the movie is about the Snowshoe Party known as the Forlorn Hope, not a story of the entire Donner Party). It was written and directed by TJ Martin and stars Crispin Glover ( Beowulf and Back to the Future ) as William Foster, and Clayne Crawford ( Wristcutters: A Love Story ) as William Eddy. The issue of cannibalism was on the minds of the filmmakers, as it is a recurring plot device. The actors took up the theme, such as Crispin Glover who said that This historical incident is a fascinating portion of American history and rich material for an actor to sink ones teeth into. The pun is intended. Other actors include Mark Boone Junior ( Thirty Days of Night ) as Franklin Graves, Jamie Allman ( The Notebook ) as Eleanor Eddy, Catherine Black ( American Psycho as Ann Fosdick, and Christian Kane ( Friday Night Lights ) as Charles Stanton. The movie was filmed near the actual site and most of the actors are near the ages of the characters they portray, with the notable exception of star Crispin Glover, 48, playing 28 year-old William Foster. There have been two name changes, probably to avoid the confusion of having characters with similar names. Sarah Foster sounds like Sarah Fosdick but most Donner buffs dont notice because we refer to these two married women by the names of their families, Murphy and Graves. For the movie audience, the filmmakers call Mrs. Fosdick Ann. William McCutcheon was changed to Milt, no doubt because there were already two other Williams (Foster and Eddy). The movie has a fairly realistic look, which you can see on stills from the movie website. None of the actors took the extreme steps taken by Emile Hirsch who lost 41 pounds to play Chris McCandless in Into the Wild. Celia Hayes, author of To Truckees Trail , a novel about the Stephens Party of 1844, reviewed the The Donner Party movie on her blog. I agree with her view that the movie looked realistic, since it was filmed on location, but in the name of drama they changed some events so the movie is not strictly accurate in historical detail. I wont catalog all the historical inaccuracies, but Kristin Johnson, author of Unfortunate Emigrants , did a good job of mentioning the most significant in her Donner Blog. Students at Elitha Donner Elementary School in Elk Grove, California, won a SEVA award in the 4th to 6th Grade category for their documentary video about their schools namesake Elitha Donner. Elitha was the daughter of George Donner. She survived the Donner Party and settled in the Elk Grove area after marrying Benjamin Wilder. The students interviewed experts, including California State historian Steve Beck from Sutters Fort and historical novelist Naida West, author of River of Red Gold: The True Story of Donner Party Survivors . Ms. West lives on the property along the Cosumnes River east of Elk Grove where Elithas house was located, and shows the site in the video. The SEVA awards are presented by the Sacramento Educational Cable Consortium. You can see the video on the SECCTV website. The Donner Party, Ric Burns 1992 documentary for the PBS series The American Experience, is now available on DVD, and for only $19.98, from Shop PBS. This is an excellent documentary that tells the story of the Donner Party using traditional sources and the then-new research of Prof. Joseph A. King. With readings from primary sources, and footage of scenes from the Trail and the cabins, this is an easy way to learn a lot about the Donner Party in 90 minutes of enjoyable viewing. For other Ric Burns films, including The Way West , about the conflict between the Native Americans and the European, visit Steeplechase Films. The Discovery Channel showed an episode about the Donner Party on its Unsolved History series. The Discovery Channel sponsored a dig at the Donner family campsites along Alder Creek, led by Oregon state archaeologist Julie Schabilitsky. The dig uncovered fire-cracked rocks, bone fragments and various artifacts. The bones exhibit evidence of butchering and are being analyzed at the University of Oregon to determine if they are human remains. You can buy the show on DVD from Amazon. You can see a U.S. Forest Service video Trail of Tragedy: The Excavation of the Donner Party Site about a dig in 1990 by archaeology students from the University of Nevada, Reno, on YouTube. The dig at the so-called George Donner Tree did not find any evidence of a Donner Party encampment, but many 19th Century artifacts were found in the nearby meadow. Disneys One More Mountain is no longer available from Disney, but it is on YouTube. This made-for-TV movie tells the story from Margaret Reeds viewpoint and emphasizes her struggle to keep her family alive. Starring Meredith Baxter with Chris Cooper. When it was available, Disney charged $99 a copy. 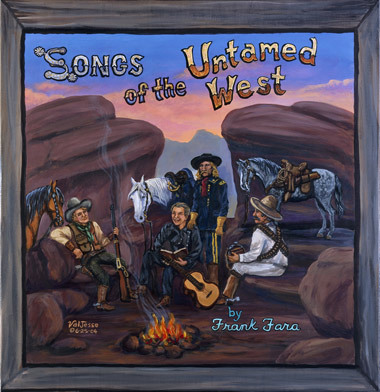 Frank Fara included his song Donner Pass on his new CD Songs of the Untamed West. Mr. Fara has been a performer and songwriter since he was a teen in Phoenix, Arizona. For years he and his wife Patty performed at Lake Tahoe casinos and on the road, where they enjoyed visiting historical sites, including Donner Memorial Park, the OK Corral in Tombstone, Arizona and Coffeyville, Kansas where the Dalton Gang met their end. Donner Pass tells the story including their abandonment by a guide who promised them a short-cut to California. You can learn more about Frank and hear his songs on his web site. You can buy his CD or download the MP3s from cdbaby. The Metropolitan Playhouse in New York presented Mortal Decisions: a diary of the Donner Party , a one-man show written by and starring Stu Richel. Mr.Richel explores the questions surrounding the Donner Party, such as "why them?" and "how would I have measured up?" Mortal Decisions was premiered by Northside Theater Company in San Jose, California in 1994, and Mr. Richel performed it at the 150th Anniversary gathering in Reno, Nevada. The show ran on February 8, 9, 15 and 16, 2008.
a riveting courtroom drama drawn from the harrowing saga of the ill-fated Donner Party and encompasses the struggles of man vs. nature and man vs. man. One of the earliest recorded slander trials in American history this factual account follows Lewis Keseberg, a German emigrant and survivor of the tragic Donner Party expedition, and his suit for slander against several other survivors, who have accused him of being a grave robber and murderer. Directed by David Regal this production features award winning MBT actor Dennis E. North (Art, Of Mice and Men). Actually Keseburg did not sue other survivors, he sued Ned Coffeemeyer of the Fourth Relief. The Meadow Brook Theater is on the campus of Oakland University in Rochester, Michigan. The performances ran from March 15 to April 9, 2006. Cathy Ward and Eric Wright mounted an exhibition entitled Destiny Manifest - Edens End at Cafe Gallery Projects London, The Gallery by the Lake, Southwark Park, London SE 16 2UA from 13th July to 7th August 2005. 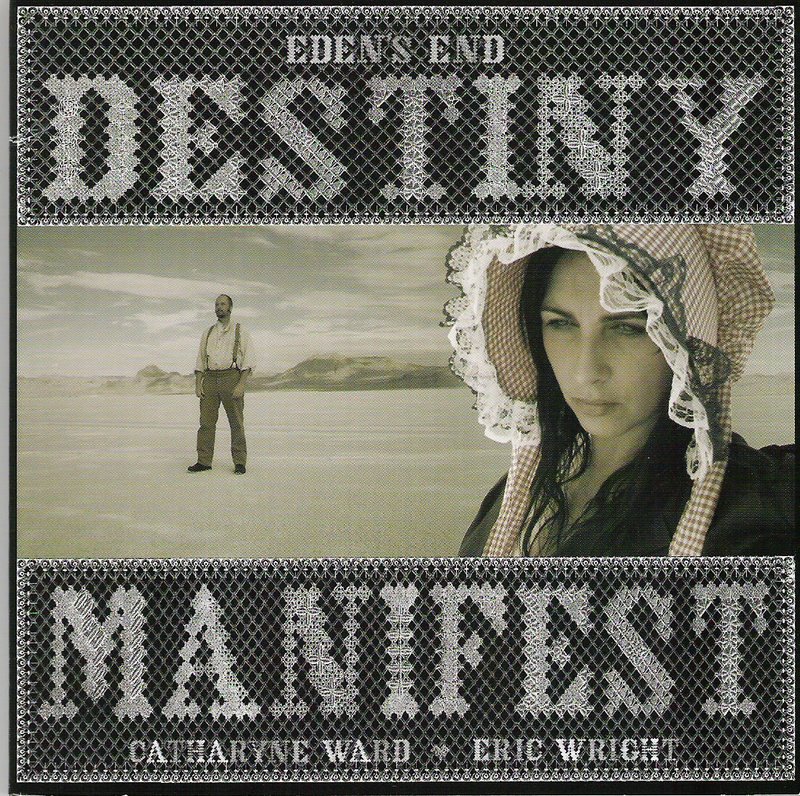 Destiny Manifest is a body of work inspired by a 7500 mile journey that traced the wagon roads of pioneer America. This journey was precipitated by a long-standing interest in the tragic Donner Party story. The exhibit comprised a 10 ft by 40 ft panoramic painting, sculptures, video projections and photographs. Visit the exhibition website for more information. Michael Bitterman and T.G. Harper have written a musical Forlorn Hope: A Donner Party Musical, based on the writings of Virginia Reed and focuses on the Reed family. The play follows the Reeds from their hopeful sendoff in Springfield, Illinois, through their troubles on the Trail and entrapment at the Lake, to James Reeds rescue of his family. Michael Bitterman is a veteran Broadway composer. The Emigrant Trail Museum at Donner Memorial State Park, Donner Pass Road, 2 miles west of Truckee,contains displays about the emigrant trail over the Sierra, including artifacts from the Donner Party. 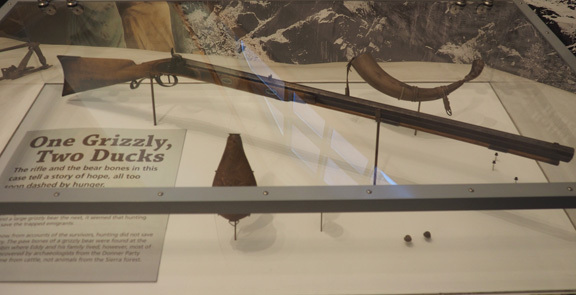 Artifacts include William Fosters rifle, below, Tamsen Donners china, and wagon parts excavated from the Salt Desert. The bookstore sells many of the histories of the Donner Party. The rangers lead regular Donner Party History hikes at least twice and some-times three times a week which start at 10:00 am in front of the museum. They are free to the public. For information and reservations for trips, call (530) 582-7892. The Oregon-California Trails Association conducts numerous events to preserve the emigrant trail. Local chapters include Missouri,Kansas, Nebraska, Utah, California/Nevada, and the Northwest.